A regular breeding species and migrant throughout the state. The Rose-breasted Grosbeak was abundant during the Minnesota Breeding Bird Atlas (MNBBA). Distributed primarily in the northeastern and midwestern United States and in Canada as far northwest as northern Alberta. The highest densities are found in the upper midwestern United States, including Michigan, Minnesota, and Wisconsin (Figure 1). Assigned a Continental Concern of 11/20 by Partners in Flight; identified as a Minnesota Stewardship species by Audubon Minnesota. Medium- to long-distance migrant over-winters in Mexico and Central America, rarely in southern United States and Cuba. Omnivorous, consuming invertebrates (especially beetles), fruit, and seeds, gathered in many ways. Loose open cup in vertical branch or crotch of shrub, sapling, or small tree. Breeding distribution and relative abundance of the Rose-breasted Grosbeak in North America based on the federal Breeding Bird Survey from 2011 to 2015 (Sauer et al. 2017). Historically widely distributed across the state, Roberts (1932) described the Rose-breasted Grosbeak as abundant in the southern deciduous forests and less abundant in the north. He also noted the species was common in prairie groves and along lakes and streams. Nesting was confirmed from the late 1800s to 1932 from Crow Wing County (nest with egg and young), Goodhue County (nests with eggs and young), Houston County (nests with egg), Isanti County (nests with eggs and young), Itasca County (nests with eggs), Itasca Park (male feeding young), Minneapolis (nests with eggs and young), Polk County (nests, fresh eggs), Rock County (nest), Stearns County (nest), St. Paul (young nearly full grown) and Wabasha County (nest with young). Green and Janssen (1975) did not present a confirmed nesting map by county; instead they simply described the species as a “resident throughout the state” and “most numerous in deciduous forests of the central and southern regions.” Janssen (1987) similarly emphasized the breeding distribution throughout the wooded portions of the state. He included confirmed nesting since 1970 from 33 Minnesota counties that range from Nobles County in the southwest to Pennington County in the northwest, to Lake County in the northeast, and Houston County in the far corner of the southeast. Counties with confirmed nesting were concentrated in the southern and central counties, though these areas were also where the highest concentrations of bird observers were located. Hertzel and Janssen (1998) expanded the counties with confirmed nesting to 44, with most in the southern tier and in the south-central counties. The Minnesota Biological Survey breeding season locations indicated the species was present in every county it has sampled, except from Wilkin County north along the Minnesota–North Dakota border (Minnesota Department of Natural Resources 2016). The MNBBA clearly illustrates its statewide distribution, with potential nesting in every county of the state (Figure 2). This includes possible nesting in 5 priority blocks in Wilkin County and in all counties bordering North Dakota. Confirmed nesting was reported in 187 blocks, while observed to confirmed nesting was reported from 48.3% (2292/4,746) of all blocks sampled (Figure 3; Table 1). The atlas added confirmed nesting in 27 counties not previously reported since 1970 by Hertzel and Janssen (1998). Previous descriptions of the Rose-breasted Grosbeak had emphasized that it primarily occurred in the central and southern regions of the state. However, when coverage included the whole state and incorporated climate, habitat, landscape potential, and detectability, the heart of the species’ distribution was predicted to be in the north-central regions and along the major river valleys (Figure 4). This primarily included the ecological provinces of the Laurentian Mixed Forest (particularly the western portions), the northern portions of the Tallgrass Aspen Parklands, and the Eastern Broadleaf Forest. These areas are currently heavily dominated by deciduous forests. In particular, the extreme northwestern counties near the boundary between Kittson and Roseau Counties were predicted to have the highest densities. The MNBBA results also highlighted a broad and even distribution in the state (Figure 2). The modeled distribution, however, is also supported by recent analysis of the federal Breeding Bird Survey (BBS) (Figure 1). The BBS relative abundance map shows the highest densities of 10–30 detections per route in central and northern Minnesota. This provides further evidence and support for defining breeding distributions based on a solid statistical design, rather than limiting distributions to where the observers are located. Cutright et al. (2006) describe a statewide distribution in Wisconsin based on their recent breeding bird atlas with confirmed, probable, or possible nesting in about 89% of the 1006 quads sampled. They did not include a probability map, so their results cannot be compared to the MNBBA. The Ontario breeding bird atlas (Cadman 2007), however, did illustrate high relative abundance values for this species in western Ontario (0.9 to 2.6 birds per 25 point counts) along the border with Lake of the Woods to Cook County. The Manitoba Breeding Bird Atlas (Bird Studies Canada 2017) also illustrated strong breeding evidence near the border with Minnesota from Kittson to Lake of the Woods Counties. Wyatt and Francis (2002) describe many range contractions and extensions in their summary of historical changes in the breeding distribution that have occurred since the late 1800s. In particular, they describe that urbanization and agriculture appear to have produced mixed effects on the species. If the conversion of forests is not too extensive and forest fragments are still present but the canopy is open, then the changes may benefit the species. However, complete clearing without maintaining suitable forest habitat, such as has occurred in a substantial part of southern and western Minnesota, will greatly limit available habitat to a few woodlots or riparian forests along lakes, streams, and rivers. In contrast, the Rose-breasted Grosbeak has adapted to many urban environments where suitable habitat remains and is tolerant of several successional stages following forest cutting, especially after harvesting as the shrub and saplings mature. Fortunately, the species is currently secure in Minnesota. Future distributional changes are unknown until the next systematic breeding bird atlas is completed. Breeding distribution of the Rose-breasted Grosbeak in Minnesota based on the Breeding Bird Atlas (2009-2013). Summary statistics of observations by breeding status category for the Rose-breasted Grosbeak in Minnesota based on all blocks (each 5 km x 5 km) surveyed during the Breeding Bird Atlas (2009-2013). Summary statistics for the Rose-breasted Grosbeak observations by breeding status category for all blocks and priority blocks (each 5 km x 5 km) surveyed during the Minnesota Breeding Bird Atlas (2009-2013). Predicted breeding distribution (pairs per 40 hectares) of the Rose-breasted Grosbeak in Minnesota based on habitat, landscape context, and climate data gathered during the Minnesota Breeding Bird Atlas (2009-2013) using the General Linear Modeling method with an adjustment for detectability. Wyatt and Francis (2002) emphasized that the species uses a wide variety of habitats, including deciduous, mixed wooded uplands and lowlands, ecotones at the edge of riparian areas, second-growth woodlands, parks, gardens, and orchards, though most of these descriptions are from the eastern United States. They pointed out that most nests in Ontario were reported from deciduous, mixed, or unspecified woodlands and rarely from coniferous forests. In Alberta, Westworth and Telfer (1993) emphasized the species’ presence in aspen and birch stands and often was associated with conifer cover. Niemi and Hanowski (1992) identified the many conflicting habitat descriptions for this species throughout much of its range. Its distribution in Minnesota also appears to be associated with a wide variety of habitats (Pfannmuller 2012). Probst et al. (1992) recorded it as most abundant in mid-successional stages of aspen regeneration. The National Forest Bird (NFB) monitoring program illustrated that the species occurred in most of the forest cover types sampled with the highest densities and frequencies of occurrence in lowland shrub, regenerating forests, and upland hardwoods but still present in most aspen-birch forests, mixed aspen-spruce-fir, and jack and red pine forests (Niemi et al. 2016) (Figure 5). Habitat profiles from the MNBBA point counts also found it in a broad array of habitat types, but mostly it was abundant in pine forests, upland coniferous forests, shrubby wetlands, and northern mixed forests (Figure 6). Wyatt and Francis (2002) suggest that the species is “not considered an area-sensitive species” because it does not appear to be adversely affected by forest fragmentation. However, Blake and Karr (1987) in Illinois did not detect the species in forest patches less than 28 ha, while Burke and Nol (2000) in Ontario found that reproductive success and the ability to sustain populations were substantially lower in forest fragments than in contiguous forests. Hence, some evidence suggests a sensitivity to changes in landscape patterns that have occurred during the past 150 years in Minnesota (though they have been more limited in the past 50 years). Typical breeding habitat of the Rose-breasted Grosbeak in Minnesota (© Gerald J. Niemi). Habitat preference of the Rose-breasted Grosbeak in Minnesota based on the Minnesota Breeding Bird Atlas (2009-2015). Partners in Flight (Rosenberg et al. 2016) estimated a global breeding population in North America of 4.7 million breeding adults. The MNBBA estimated a Minnesota breeding population of 1.41 million (95% confidence interval was 1.25 – 2.32 million), while PIF (Partners in Flight Science Committee 2013) had only estimated 320,000. The BBS summer distribution map supports the potential for relatively high breeding populations in Minnesota (Figure 1). 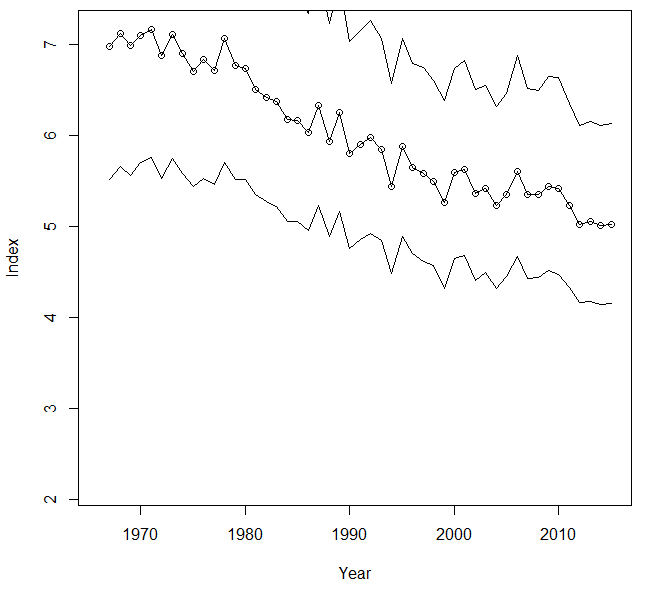 The BBS in Minnesota showed a significantly declining trend for the species of 0.68% per year from 1967 to 2015 (Figure 7) and was consistent with the survey-wide trend of 0.86% per year. In contrast, the trend in Wisconsin over the same period was insignificant. PIF (Rosenberg et al. 2016) estimated a 30% decline in the population of the species from 1970–2014. The BBS trends for North America indicated widespread declines from 1966 to 2015 throughout the eastern United States and in much of the upper Midwest, including both northern and north-central Minnesota (Figure 8). 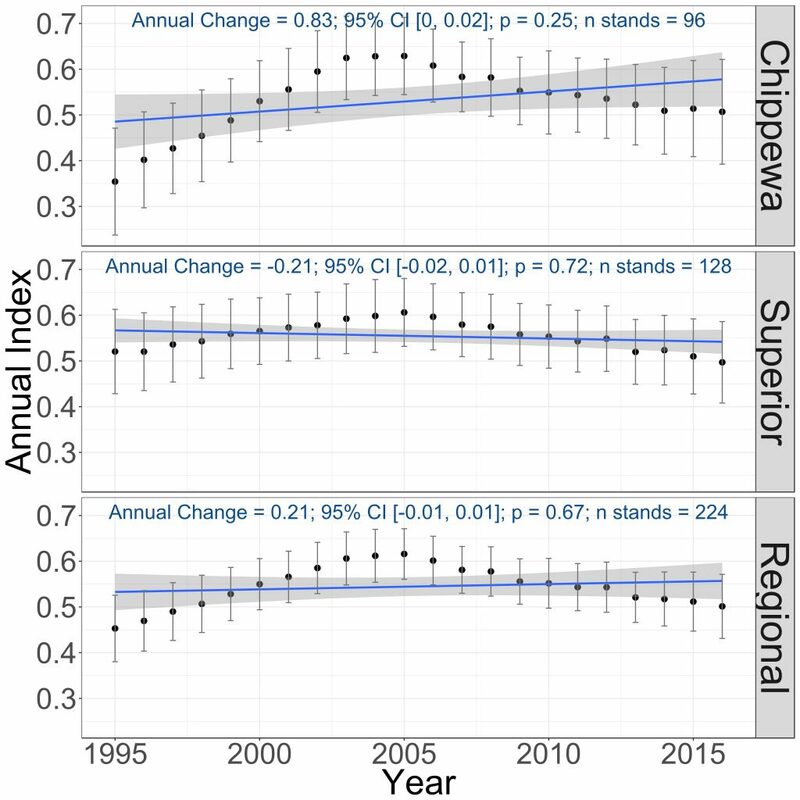 In contrast, the NFB trends in the Chippewa and Superior National Forests as well as the combined regional trend were insignificant from 1995–2016 (Figure 9). Coverage by the NFB program is more detailed than the BBS; however, the widespread declines deserve more detailed scrutiny. Overall, mean population densities in the Chippewa and Superior National Forests were similar and ranged from 1.1 to 1.2 pairs per 40 ha respectively. Within specific habitats, typical densities in regenerating forests varied from 1.6 pairs per 40 ha in regenerating conifer forests of the Chippewa National Forest to 2.3 pairs per 40 ha in regenerating non-conifer forests in the Superior National Forest. Similar densities of 2.3 pairs per 40 ha were observed in pole-size aspen-birch forests in the Superior National Forest, but the highest density observed was 2.8 pairs per 40 ha in pole-sized aspen-birch forests in the Chippewa National Forest. Breeding population trend for the Rose-breasted Grosbeak in Minnesota for 1967–2015 based on the federal Breeding Bird Survey (Sauer et al 2017). Population trend map for the Rose-breasted Grosbeak in North American for 1966–2015 based on the federal Breeding Bird Survey (Sauer et al. 2017). Breeding population trends of the Rose-breasted Grosbeak in the Chippewa and Superior National Forests and the combined regional trend, 1995–2016 (Bednar et al. 2016). Although the species is considered to be relatively secure because of its wide use of breeding habitats, its relatively wide breeding distribution, and the lack of data on specific threats, its current declining trend in North America deserves scrutiny. The Rose-breasted Grosbeak is considered to be a moderate conservation concern with a score of 11/20 (Rosenberg et al. 2016). Moreover, Pfannmuller (2012) listed the species as a Stewardship Species in Minnesota primarily because Minnesota is estimated to account for 10% of its breeding range and 6% of its global population. If breeding populations have been underestimated as potentially indicated in the population abundance section, then these percentages may even be higher. Loss et al. (2014) found the species to be sensitive to collisions with both low- and high-rise buildings, where it ranked thirteenth and seventeenth among species with a greater risk factor of 24 and 16, respectively, relative to an “average” species risk. Its susceptibility to tower kills is unknown, although Longcore et al. (2013) did not list it in their summarization of species susceptible to mortality from towers. The species is sensitive to complete loss of forested habitat because it requires suitable nesting substrate and diverse food supplies to raise its young. Niemi and Hanowski (1992) did not find a negative effect of increased forest harvesting and management in Minnesota because of its use of edge and second-growth habitats; however, its sensitivity and reproductive success in small forest fragments and in urbanized settings is in need of further study. Grinde et al. (2017) found a positive response of the species to forest harvesting in north-central Minnesota, but the study area existed within a large forest matrix with minimal fragmentation from roads or any form of human development. Langham et al. (2015) and the National Audubon Society (2015) did not list this species as sensitive to future climate change based on its climate envelope models. Matthews et al. (2004) suggested that the species will decrease in abundance as its range northward contracts due to climate change, primarily due to reductions in the availability of quaking aspen. Blake, John G., and James R. Karr. 1987. “Breeding Birds of Isolated Woodlots: Area and Habitat Relationships.” Ecology 68: 1724–1734. Burke, Dawn M., and Erica Nol. 2000. “Landscape and Fragment Size Effects on Reproductive Success of Forest-breeding Birds in Ontario.” Ecological Applications 10: 1749–1761. Grinde, Alexis R., Gerald J. Niemi, Cheryl Adams, and T. Bently Wigley. 2017. “The Important Role of Young Forests in Forest Biodiversity Management.” Forestry Source 22(2): 12–13. Westworth, D. A., and E. S. Telfer. 1993. “Summer and Winter Bird Populations Associated with Five Age-classes of Aspen Forest in Alberta.” Canadian Journal of Forest Research 23: 1830–1836.